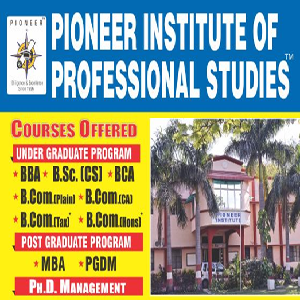 Pioneer Institute of Professional Studies, Indore organized 21st National Conference on Saturday, October 10, 2015 on the theme “Mapping for excellence: Challenges Ahead in Evidence Based Management”. The eminent guest for the conference were Dr. Narendra Dhakad, Former Additional Director, Higher Education; Dr. P. N. Mishra, Director, IMS, DAVV, Indore in presence of Shri P. C. Jain, Group Chairman, Pioneer Society; Dr. CA P. K. Jain, Principal, Pioneer Institute of Professional studies, Indore, Dr. CA Prashant Jain, Executive Director, Pioneer Institute of Professional studies, Indore and Dr. Mona Tawar, Director, Pioneer Institute of Professional studies, Indore. INAUGURAL SESSION: The Inaugural Session started at 9:00 A.M. The Inaugural session started by welcoming the Guest Dr. Narendra Dhakad and Dr. P. N. Mishra. The conference was inaugurated with the traditional lighting of the lamp and Saraswati Vandana, where all the dignitaries and Directors were present. It was then followed by Institute Presentation, demonstrating Mission, Vision, Quality Policy, Institute Infrastructure and Placement Records of the Institute. The Presentation was highly appreciated by the Dignitaries, congratulating the Management on the growth and progression of the Institute. Dr. CA P. K. Jain started his speech, focusing at the aim behind to conduct this conference. He explained about the theme of conference that Evidence Based Management as a research discipline and as a business function is very critical for both the Academics and Industry. Evidence-based practice is about making decisions through meticulous, explicit and judicious use of the best available evidence from multiple sources by: Asking: translating a practical issue or problem into an answerable question; Acquiring: systematically searching for and retrieving the evidence; Appraising: critically judging the trustworthiness and relevance of the evidence; Aggregating: weighing and pulling together the evidence; Applying: incorporating the evidence in the decision-making process; Assessing: evaluating the outcome of the decision taken to increase the likelihood of a favorable outcome. Dr. Jain further explained that by ‘evidence’ we mean basically information or facts. This information may come from controlled scientific research indicating some general facts about the world, human beings or organizational practices. It may come from local organizational or business indicators, like company metrics or observations of practice conditions. Even personal experience can constitute evidence, as in the case where an entrepreneur learns from having launched different business activities the one that seems most likely to pay off. Shri P. C. Jain addressed about what is evidence based practice by explaining Both the Individuals with Disabilities Education Act and Elementary and Secondary Education Act require that schools use programs, curricula, and practices based on "scientifically-based research" "to the extent practicable." This means that whenever possible, the educational interventions being used must be strongly supported by evidence from well-conducted research studies. Shri P. C. Jain further explained that building evidence into education there is a huge prize waiting to be claimed by teachers. By collecting better evidence about what works best, and establishing a culture where this evidence is used as a matter of routine, we can improve outcomes for children, and increase professional independence. Now we recognize that being a good doctor, or teacher, or manager, isn’t about robotically following the numerical output of randomized trials; nor is it about ignoring the evidence, and following your hunches and personal experiences instead. We do best, by using the right combination of skills to get the best job done. Dr. Narendra Dhakad addressed all that instruction is individualized based on the student's needs. That's why it is especially important that the knowledge and experience of professionals and parents are also considered when deciding how to teach a student with disabilities. Professionals and parents should know about instructional practices and interventions that have been shown by research to be most effective. These research-based practices should then be matched with a student's unique needs and skills when developing a student's Individualized Education Program .It is important to record what works so that evidence can emerge over time that offers new insights into teaching and learning for students with disabilities. Dr. Dhakad further explained that Educational research may be said to be scientific when it uses a sound research design. The outcomes of students receiving a tested teaching strategy or intervention are compared to similar students who do not receive the intervention. Educational research is based on high quality data analysis. Researchers must be sure to carefully collect, store and examine the data. It involves other researchers to review the results. The study should be reported in a journal so other researchers can review the methods used and repeat the research in other settings. Dr. P. N. Mishra addressed students that evidence is always gathered in a particular context, which means that evidence in itself can never be treated as a "universal truth". Even the outcome of the most valid and reliable scientific research is only intended to inform practitioners and aid them in questioning their assumptions. Think of it perhaps in legal terms. A court is presented with many forms of evidence: DNA, people's testimonies, alibis, locations, statements, etc. Each piece of evidence means little without contextual knowledge, such as motive, opportunity, etc. The evidence in itself doesn't tell you what to decide, but it does help you to make a better decision. Decision-making processes are enhanced through the use of valid and reliable evidence. For this reason we use evidence quite automatically and unconsciously for even the smallest of decisions, whether it’s buying someone a birthday present or wondering where to go out for dinner. In most cases we actively seek out to obtain information to support our decision, such as the opinion of our partner, the experiences of friends, or the comments of a local newspaper’s critic. Sometimes this information is so weak that it is hardly convincing at all, in other times the information is so strong that no one doubts its correctness It is therefore important to be able to determine which evidence is the ‘best’ – that is, the most valid and reliable – evidence. The Research Paper Presentation Session in which the Session Chair was Dr. CA P. K. Jain included the submission of research paper and their presentations by various delegates and researchers from reputed Institutes. The Researchers arrived from different cities like Surat, Ujjain, Jhabua, Sagamner, Satna, Bhopal and Indore etc. In last session of conference, certificates were distributed to the participants by Dr. CA P.K. Jain, Dr. CA Prashant Jain and Dr. Mona Tawar. At last, vote of thanks was given by Dr. Mona Tawar and concluded the conference session.